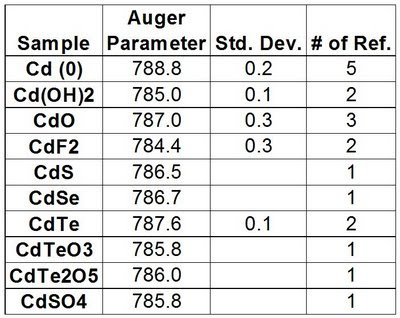 A table of values for the Cd 3d5/2 - Cd M4N45N45 modifed Auger parameter is given below. See cadmium metal file and Figure 1 for position of the Cd M4N45N45 Auger peak. Table 1. Cd 3d5/2 - Cd M4N45N45 Auger parameter values. Figure 1. 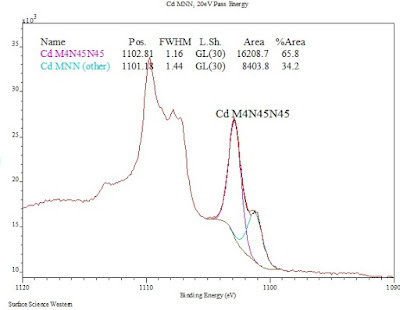 Cd MNN spectrum (Al source) of cadmium metal showing the position of the Cd M4N45N45 peak.